Oughtred Society Slide Rule Home Page. 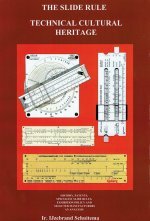 The Oughtred Society was founded in 1991 by a group of slide rule collectors and is dedicated to the preservation and history of slide rules and other calculating instruments. Over the past three decades it has evolved to an international organization with members in 20 countries. It is noted for its highly acclaimed Journal of the Oughtred Society, published twice annually. The Society is a non-profit educational organization. Society goals include the dissemination and sharing of information and encouragement for collectors. We are affiliated with organizations in the United Kingdom, Germany, The Netherlands and Italy. Our activities are carried out by members who volunteer to do various tasks and projects. Membership is open to anyone. Click "Membership" in the left navigation menu for more information about member activities and benefits. This year there once again there will be dozens of unique and interesting slide rules for sale at the Oughtred Society annual auction. CLICK HERE FOR A PARTIAL LIST OF ITEMS FOR SALE AT THE 2019 ANNUAL MEETING. The host hotel is the Four Points by Sheraton Las Vegas East Flamingo across the street from the museum. Booking is NOW OPEN at the hotel for the special rate of $102 (plus tax) for Friday and Saturday nights with some extensions before and/or after possible. BOOK NOW AS THE NUMBER OF ROOMS IS LIMITED! The meeting will feature displays of slide rule collections, an auction, buying, selling and swapping, live presentations and the opportunity to meet and talk with fellow slide rule enthusiasts, many of whom are experts in their areas of interest. Additional items from the Thomas Wyman and Bob Otnes collections will also be offered at the auction. Optional group dinners will be held on Friday and Saturday evenings at the hotel in a private meeting room - food will be catered by Buca di Beppo, Italian Restaurant. The IM 2018 meeting was held recently, courtesy of the United Kingdom Slide Rule Circle (UKSRC). Sixty Delegates and Partners from nine nations met in Stratford-upon-Avon. 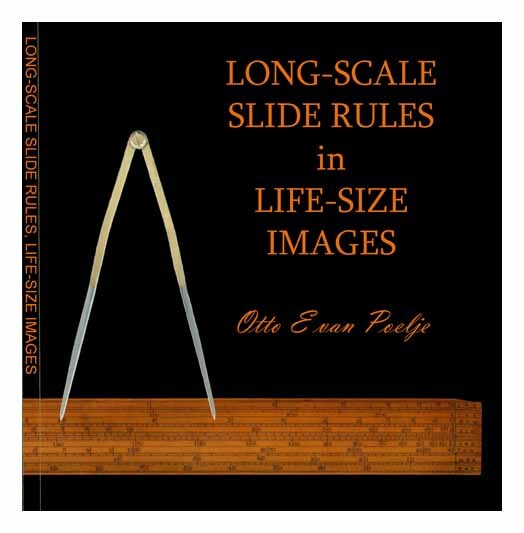 Some 240 slide rules were displayed, and eight talks were given. The meeting report is available here. OS Awards and Fellowships: The OS Award Committee has announced the 2018 Hall of Fame winners. The OS Award went to Prof. Dr. Ina Prinz, Prof. Dr. Bernhard Korte, and Richard Smith-Hughes. The 2018 Fellowships went to Paul McConnell and Hans Kordetzky. Calling all authors! 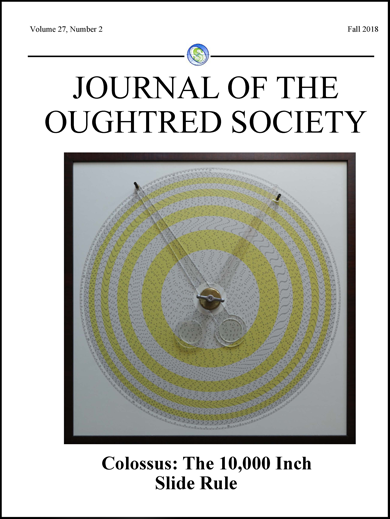 The Oughtred Society is preparing the 2019 Journal issues, and is looking for some good articles! Contact Journal editor Jim Bready with your proposal, and see The Journal of the Oughtred Society web page for more information and to download the JOS Guidelines for Authors. Bob Otnes (d. April 15, 2019) The Oughtred Society is saddened by the death of Bob Otnes at his home in the bay area Monday night. Kind and gentle Bob was an avid slide rule collector and authority, and loved to discuss and explain the various complexities of the calculating devices in his collection. Bob's congenital heart condition became progressively worse over the past half year. June 16-17, 2018: An SR-71 symposium was held in McMinnville, Oregon at the Evergreen Aviation and Space Museum. 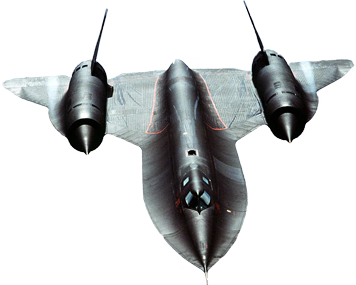 The SR-71 was the last aircraft designed using slide rules. 2018 Oughtred Society Annual Meeting Report: The Oughtred Society Annual Meeting for 2018 was held at the Atomic Testing Museum in Las Vegas, Nevada and featured many fascinating displays, sevaral presentations, two very nice dinners, and hundreds of interesting items at auction and/or for sale. Richard Davis has retired as Oughtred Society webmaster. Ace Hoffman has assumed that position as of 2018. In 2019 Ace was voted onto the O.S. B.O.D.. 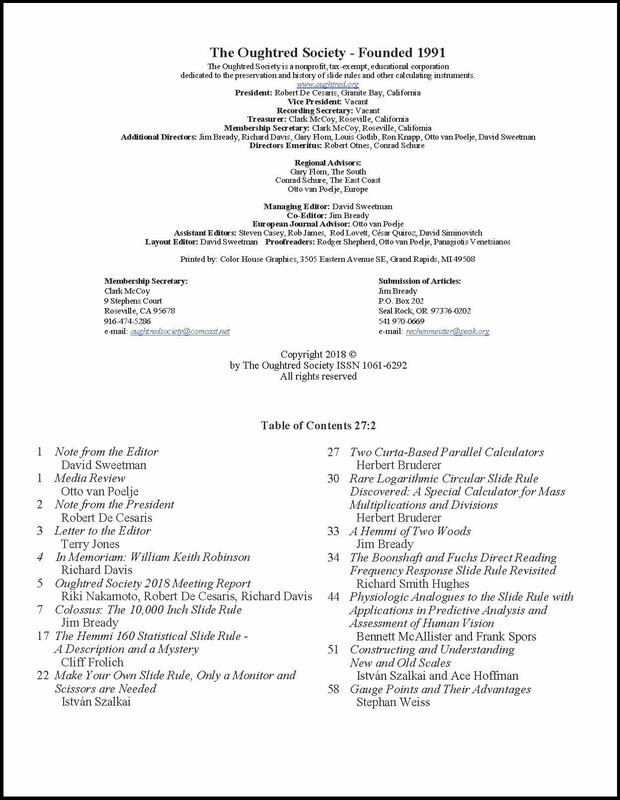 Ace is a computer programmer and published a paper in the Spring 2018 Journal titled The Linear Digital Slide Rule. New Oughtred Society Board Members The Oughtred Society is pleased to announce that two new members have been appointed to the board of directors: Louis Gotlib and Jim Bready. Louis will also be heading up the Education Committee. 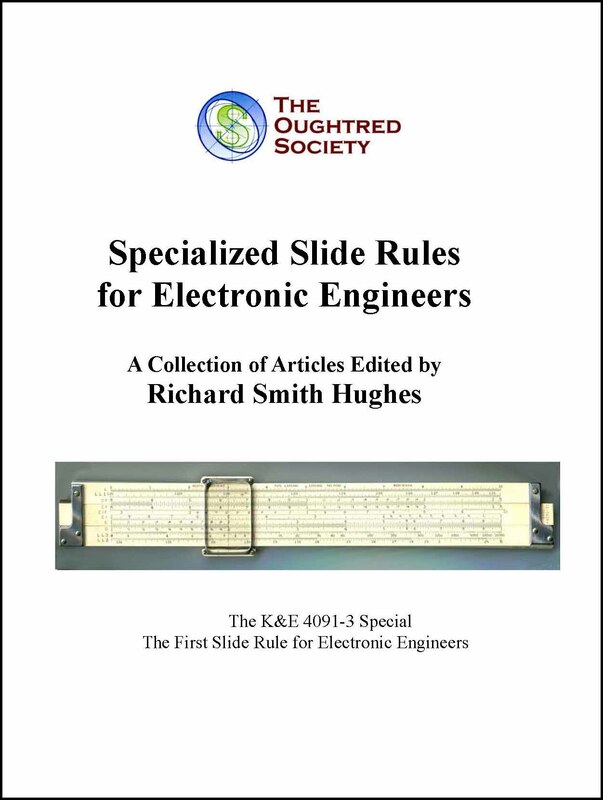 NEW BOOK: The Oughtred Society is proud to announce the publication of Specialized Slide Rules for Electronic Engineers. 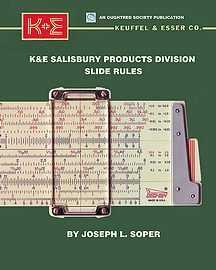 This new publication is a collection of articles about many of the specialized slide rules used in electronic design. This monograph is an extensive collection of articles edited by Richard Smith Hughes. Richard spent his career designing electronic circuits and when retired taught college level circuit design courses. Richard begins this collection with a brief history of electricity including early communication using spark gap technology. Next the various slide rules, with their special scales to calculate inductive reactance, capacitive reactance and resonant frequency, are described in detail. This publication is now available for sale on our website. 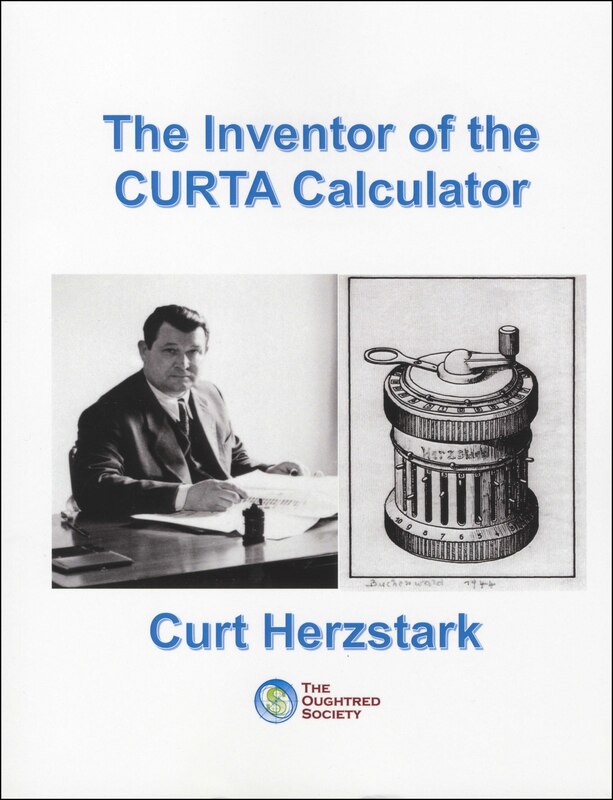 NEW BOOK:The Oughtred Society is proud to announce the publication of The Inventor of the CURTA Calculator an autobiography. This book is the story of the remarkable life of the inventor of this ingenious device, how he started in his father's mechanical office machine company in Vienna, eventually running the company himself, designing the Curta and becoming embroiled in WWII as a prisoner in a Nazi concentration camp and finally the difficulties of setting up full production after the war in Liechtenstein. Additional material written by the late Tom Wyman and Dr. Robert Otnes is included. Possible 2018 EAST Coast Meeting: Discussions are in progress to reestablish a Fall Meeting on the east coast this fall; please contact members Ben Strange or Louis Gotlib with your interest in this meeting. Archive of Collections. New Collections added to this Archive. The first collection in this Archive was that of the late Tom Wyman. We now have four collections featured; items from the collections of Paul Tarantolo, Louis Gotlib, Richard Davis, and Thomas Wyman. All four collections continue to grow under the continuing direction and efforts of Clark McCoy, Rod Lovett, Ted Hume and Richard Davis. We invite you to view this new Archive of Collections and consider having us post your collection to the OS website for posterity. Slide Rules of the Major Makers. 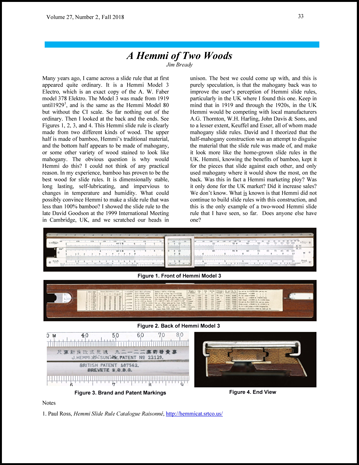 A New feature on the Oughtred Society Web Site: In this new feature we present all slide rules produced by the eight major makers. This information has existed in several web locations but now exists here in one location. This data was gathered over many years by dedicated researchers. ♦K&E has a cross reference with details for all rules, plus a partial photo archive. ♦Faber-Castell has a list of all rules with limited details, plus a partial photo archive. ♦Dennert & Pape/Aristo have a list of all rules with limited details, plus a partial photo archive. ♦Pickett has a cross reference with details for all rules. ♦Dietzgen has a cross reference with details for all rules, plus a dateline matrix. ♦Nestler has a list of all rules with limited details. 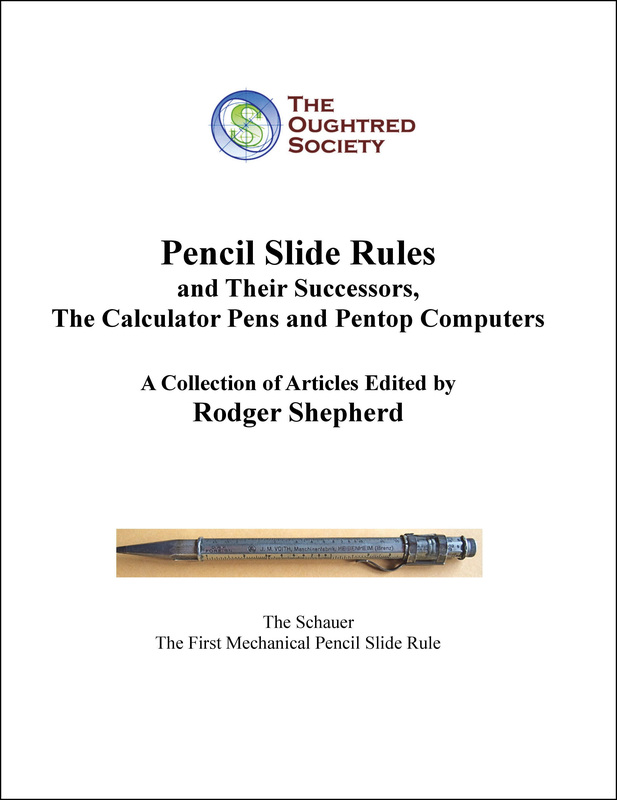 Pencil Slide Rules: A new publication introduced earlier in the year by the Oughtred Society: Pencil Slide Rules and their Successors, The Calculator Pen and Pentop Computers is a collection of articles that admirably covers this subject! This monograph is authored and edited by one of our Oughtred Society founders, Rodger Shepherd. This publication is now available for sale on our website. 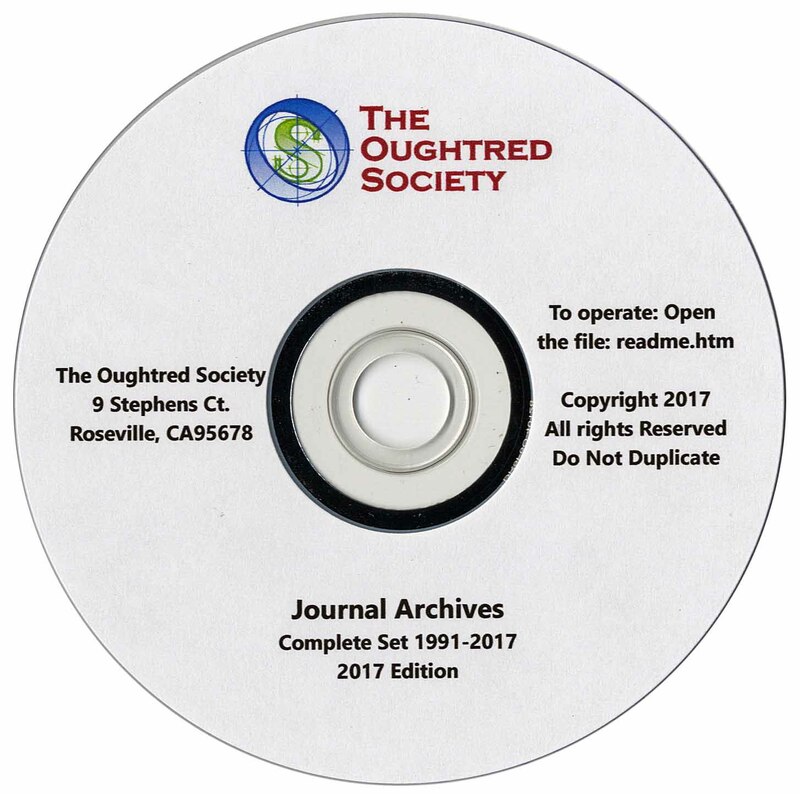 JOS DVD is available for sale, containing 26 years of the Journal of the Oughtred Society in PDF format. OS members and non-members(individuals and institutions) may purchase the DVD by going to the Journal page and paying for the disk via Paypal. A Search Facility for the Journal of The Oughtred Society awaits your use. (See Journal Search in main menu at left.) This new Search Facility displays high resolution PDFs of Journal articles. You may search by several methods -- author, title, keyword, or for any word that appears in any article, or for all articles in a given year, etc.The search facility was created by Rod Lovett. Request for Articles for the 2019 and 2020 Journals. Be a contributing author and share your knowledge and interests. 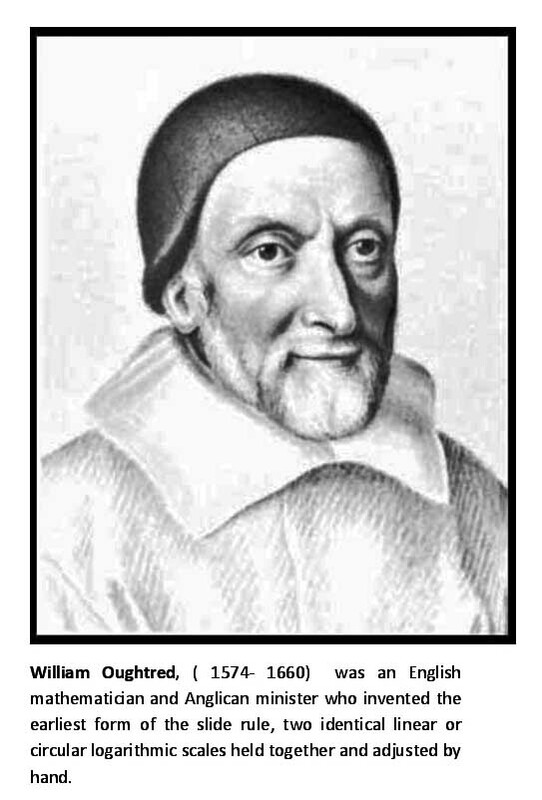 For ideas and inspiration, read "Yes, You Can Write for the Journal of the Oughtred Society" (82KB pdf). 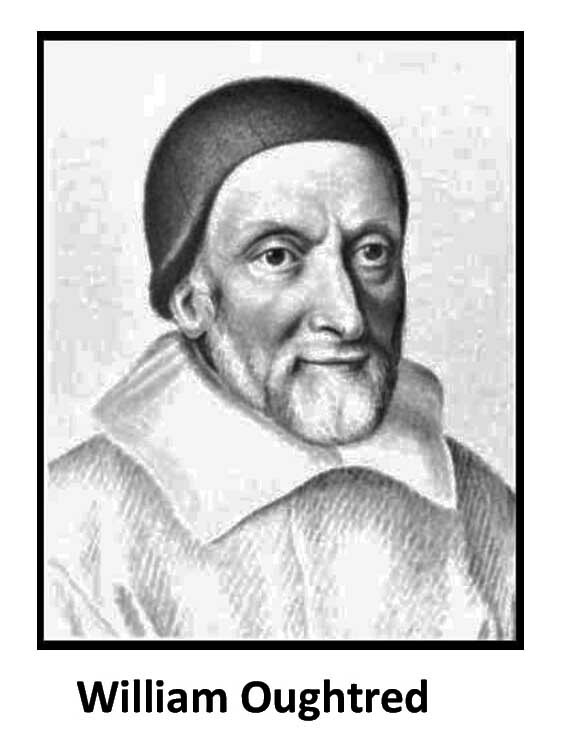 Sample Articles from the Journal of the Oughtred Society. 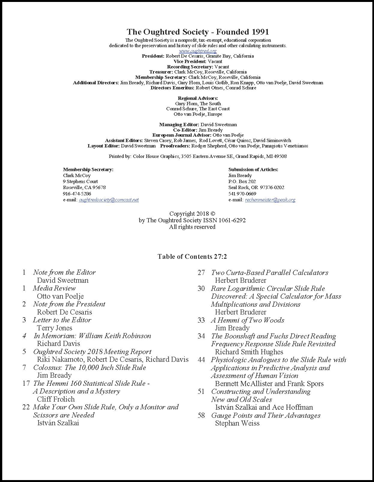 The Oughtred Society is pleased to present seven articles from past issues of the Journal. See NEWS ARCHIVES. JOS Plus is the website location where supplemental material appears for articles in the Journal of the Oughtred Society. View these supplemental materials by going to JOS Plus. NEWS ARCHIVES - Past announcements and news.